Harper - you are SEVEN months old today!!! Harper what are you up to this month??? You wear size 6-9 months clothes. The thing you have grown out of the quickest is your footed PJ's - probably because you are so long. You still love your pacifier and I don't know what we would do with out it! You have become a great napper!! After almost 6 months of NO naps - you now take a 1-2 hour morning nap and a 2-3 hour afternoon nap (if we are home)! You have slept in your own room for a month and it's going great. You have slept 12 hours with only getting up once for 30 minutes several times. Still not TOTALLY through the night - but we can live with it! You have now been on a helicopter ride, several car trips and an airplane! You are a great traveler! You like to be out and about. You are happiest when we are going places and doing things. You are a GREAT eater! You eat 3 solid meals a day and nurse every 2-3 hours. You LOVE baby yogurt - we eat that for breakfast every morning. You have eaten applesauce, bananas, avacados, sweet potatos, carrots and green beans. I think your favorite is carrots. You smile a lot and really your little grin is the best thing in the whole world! You have never been a cuddler but recently - you will put your arm around my neck and snuggle your head in my chest and just let me hold you. I could do it 24/7. You are sitting more and more every day. You like to play with your dolls and stuffed animals in the floor. I have a feeling when I write your 8 month post - you will be crawling. You are trying SO hard! You LOVE the exersaucer - best money I have ever spent! ha! You are obsessed with tags. Anything that has a tag gets your attention. No need to buy you toys - just give you a few tags to play with. We love to listen to you wake up over the monitor. It always starts by you moving around and then you make a little grunt or two and then you start yelling "HEY!". I know that's not really what you are saying - but it's what it sounds like and it makes us laugh. You will yell "HEY" louder and louder and louder until we come. You babble and make noise CONSTANTLY. You are not a quiet child. We know that once you start talking - you might not ever stop. I'm pretty sure you look JUST like your daddy - but you got your momma's personality. Bless your heart! Just when I think I can't possibly love you anymore - I wake up the next morning and I do. I can't believe how much you have changed and grown in just six short months!!! I can't imagine what you will be like in another 6 months but I can't wait to find out! Today at church they had all the incoming 1st graders come up and they were given Bibles. I was trying to imagine what you will be like at that age. I know that we will be so proud of you and love you more with each coming day! I hope you will always know how loved you are! It is so hard to believe that Harper is 7 months old! Time flys! She is looking more adorable everyday. Happy 7 months you gorgeous girl!! Happy seven months sweet little Harper!!! happy 7 months- i LOVED this age with my little ones. enjoy the last few days of her being immobile! hehehe! I think she looks just like YOU! so precious. love the letter. so hard to believe that Harper is 7 months old.. at times I wish I could hold back time and just enjoy it... good thing there is always tomorrows and forevers. Happy 7 months Harper! You are adorable! She is gorgeous! Happy 7 months! your little girl is so cute! My three year old was obsessed with tags also at that age so i got her a Taggie Blanket and she doesn't leave the house without it now. You may or may not want to get her one!!! She is getting so big! I need your trick on getting her to nap. My 6 month old still does not nap! I love watching her grow up!! She's just precious! It's hard to believe she is seven months already! She is simply precious! check out taggies.com They have this great idea about clothes and toys covered in tags! precious! you keep saying she looks like your husband but I sure do see a lot of you in her! That's so amazing. Harper is a lucky baby to have a Mommy and Daddy loving her so much. Happy 7 months to the three of you!! 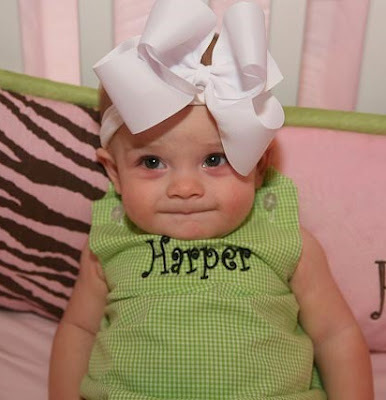 And, I must say, Harper wears THE CUTEST clothes! What a growing girl! I love her sweet faces. Thanks for sharing! Your baby girl is SO beautiful! What a doll! Miles love the baby yogurt too. (Confession: I've snuck a bite and it's pretty tasty!!). I'm sure she'll crawl soon, Miles took off at about 8 months. She is so cute! Happy 7th months sweet baby girl! And Lauren LOVES tags too! In fact, she tore 2 off of new outfits today. HA! Seven months?!? I think my jaw dropped a little bit when I first saw the title to your post! Time has flown by, I'm glad she's doing so well! Love these pictures today! Happy 7 month Birthday! That is sounding old. Harper will be so blessed to read this blog when she gets older. She will know she is treasured - what a gift! Kelly, I had to comment. Harper is just the sweetest little girl. I have a daughter, Katie, who is 20 months and for as long as I can remember, she has been obsessed with TAGS! We bought her a taggie blanket (www.taggies.com) and she LOVES it! They are not very big and easy to carry around. Katie loves to carry hers around and sleep with it. It has definitely become her lovey! You might be able to find them in stores in your area. Enjoy every minute with Harper! They grow much too quickly!! She is precious. It flies by SOOO fast. This morning, when I was sitting in church it was the first time that all my kids were in big church, because my baby has graduated from chapel. It seems like I was just sitting on that same pew holding my first. I can't believe she's seven months already. You guys are one of the cutest little families I've ever seen. I totally believe she says "hey" in the mornings. I have to I mean I think for sure my cat calls me Mama! How time does fly! She is so gorgeous and so adorable! She will absolutely love reading the story of her life when she gets older. She is truly blessed! What a wonderful mommy you are! She is just precious and already so big!! I can't believe she's so close to crawling...won't be long now and then you'll really have your hands full!! Ha! Harper is getting so big! Hard to imagine her as a first grader. I look back at pictures of my little guy from when he first came to live with us and marvel at how big he is now....I thought he was big then but he looks like such a baby! Harper is getting so big, thank you for sharing her with us all!! Time just goes so quickly! She is getting cuter and cuter every day! I love watching her grow up! She just gets more and more beautiful everyday. Kelly, Harper is precious and has a great smile! She looks like such a happy baby. God bless. When she smiles, her eyes just light right up! Even my husband commented that aside from totally looking like a little girl (where some babies it can be hard to tell), but her eyes just smile with her mouth. Precious! Wow, time flies!! She's so precious! I think she is so adorable. I love these month to month progress posts! she is too darn cute!! So sweet! Don't they grow up fast? Mine is already 4 1/2 months and it feels like just yesterday she was born! Harper is precious! Aww, such a cutie! She's come a long way! Taggie blankets are great! You can also make them. My son loved to cuddle with his stuffed animal that had a soft tag on it. Harper is so cute! She's just adorable. 7 months is such a fun age. Enjoy! I know this may be random, but I think she looks like your mama! The pictures that you've put on here of her make me think they look a lot alike! She's VERY cute and looks so happy! 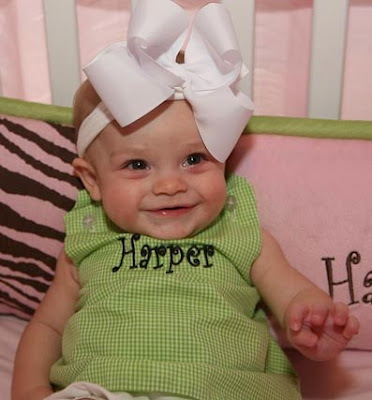 Harper is so beautiful! That smile is the cutest thing I have ever seen. I am so glad that she is napping better for you. It is rough when they won't nap. Mine loved her pacifier. We couldn't leave home without it. I had to have a few in the diaper bag, my purse, the console of the car. Ha! wow! I can't believe it has been 7 months already!! She is to0 cute as always! Harper is too cute - she has one of the sweetest smiles I've ever seen! I would definitely get her a taggie blanket - all of my kids have them and love them. They're making really soft ones now. My youngest just grew out of a really cute pair of Taggie jammies that I found at Dillard's a couple of years ago - not sure if they're still making clothes but there are tons of other cute Taggie things - especially for little girls! Harper is so adorable. Reading about her reminds me so much of my baby girl. She hates the church nursery, too! We are also praying that she will come to love it soon. I completely understand about loving your baby more each day, too! Just wait till Harper can talk! My two and half year old yells in the monitor "mommy, wake up and come and get me"! Or I hear "are you ever going to get me?" Ha! She was just a verbal as your Harper and now she just talks our ears off. Her poor sister who is 8 months old can't get a word in edge wise! She waits until her sister isn't around and the babbles her head off! Kelly- You think the best day ever is when they are born..but just wait till the day that she accepts Jesus as her Lord and Savior- now THAT is the best day ever...Mine just did AND got baptized a few weeks ago. It is the biggest relief knowing they are safe!!! Oh my goodness....she is SUCH A DOLL!!!!! It is so fun to read your blogs and keep up with Miss Harper. She is so cute. I love these posts. It is great to hear what Harper is up to and how much she is growing! your blog just makes me smile. More priceless smiles from a beautiful 7 month old! Thanks so much for sharing. She is just absolutely adorable! It's amazing how fast these past 7 months have just flown by. Happy 7 month Birthday Miss Harper! And I agree, Harper has the cutest grin. The big smile is cute, but that grin, oh boy.Now Kelly, don't blink, 'cause if you do she will be asking for the car keys. It seems to happen just that fast. Love every minute of it. Happy 6 Months Harper! That is so funny that you mention that about the tags because Lucas (5 months) is doing the same thing! I meant happy 7 months!! Cutest baby EVER ... excluding my own, of course!! Happy 7 months, Harper! She's adorable! Can't believe she's 7 months already. Wow she's changed so much! Since she’s pretty much happy-go-lucky everywhere else, I’m wondering if she’s bothered by something unique to the nursery? And, since she has known allergies to some foods, might she be having an ‘allergic reaction’ to some product that’s used in the Church nursery and not anywhere else you go? The reason I ask is: I, too, have allergies to some foods…but the reaction I have to certain smells are far, far, FAR worse than my food allergies. Eating the ‘wrong’ foods makes me break out in hives and my eyes will swell shut. I look bad, but can still function. Give me a whiff of magnolia blooms, though, and my vocal chords freeze up – all I can do is whisper. That neato spray* made to neutralizes odors? Makes my entire throat/airway feel as if it’s coated with cooking spray. I can’t get out of the “neutralized” space soon enough! I, literally, feel as if I’m drowning! Heck, I can’t even walk down the laundry, dish, and body soap aisle(s) at a store without getting VERY uncomfortable – I have to more or less, sprint down the aisle and grab what I need because of my extreme sensitivity to some smells/scents. And picking out a new tube of lipstick? I have to smell it, first, to see if it triggers my ‘allergies’…then see if there’s a color I like. Beautiful bowls of potpourri Martha Stewart-ed all around the house? Fuggeddaboudit! All this by way of saying: Maybe you could put on your Detective Hat (Detective Nose?) and see if there is some smell – anything – used in the nursery that HBS doesn’t normally come across? A spray? A disinfectant wipe used on the hard surfaces? A powder and/or cleaner used on the rugs/floor? The laundry detergent used on the crib sheets? Even a perfume one of the constant nursery attendants uses? It could be anything…but if it IS a smell that’s making HBS so uncomfortable in that space, the process of elimination will ferret it out. If HBS does have sensitivities to certain smells, and if she feels –at ALL- the uncomfortable, really closed-in, can’t-wait-to-get-OUT-of-here, feeling I get when my ‘smell allergies’ are triggered, it’s no wonder the poor dear fusses. Anyway, just a thought about her weekly Church Nursery Grumps. beth. I love that girl!! Happy 7 month!! Hating the church nursery could be a good thing. Where we worship, you are kicked out of the nursery at 2. Which means us parents are trying to teach a two year old to be still and quiet. I never took mine to the nursery for that reason (and I have 3 rowdy boys). They all learned to behave in church from a young age. And now if they are disruptive, we take them out, tell them they have to be quiet and take them RIGHT back in. I have never taken them to the nursery when they are misbehaving. Children are smarter than we think...they figure out quickly that if they misbehave they can go play! And they start Bible class as soon as they start sitting up so they still learn about the Bible. And as far as the carrots go...she can have mine! I think they taste like dirt! haha! Thank you for sharing with us! Beautiful pix! I started reading b/f Harper was born. My son is a month older and I look at pix of each and cannot believe how they've grown! Harper truly gets cuter every day!! Thank you for sharing such happy pictures of her! I have enjoyed watching her grow and feel like I know your family so well! haha!! I gave you a blogger award. Check out my blog for more information. Target gift card giveaway today, Check it out. Most importantly, Harper is STILL a doll! She looks like a pro at the monthly photo shoot now! It's like she knows what it's all about and she's all about flaunting it! I didn't have time to read everyone's posts before me so someone may have already mentioned this. There is a brand of kids toys called Taggies. They make blankets, soft balls, dolls, stuffed animals, etc. and they all have soft satin tags all around the perimeter. Harper might like that! www.taggies.com or I know lot of baby boutiques have them. She is an absolute doll!! That is so funny about Harper loving tags. My little boy who is 9 months old LOVES tags. I swear he can find them on anything. I even made him a taggy blanket, but it must not be the same! My nephew LOVED tags at that age (and a little older), too. There is a toy out there called "Tagley", and it's basically a ball covered in tags that stick out in all directions. He loved it! Harper is too precious! Enjoy her! Yea! Happy 7 months to Harper!! I have never left a comment before but wanted to tell you how much I enjoy reading stories on Harper. I found your blog when I was 8 months pregnant by clicking on a "Pray for Harper" button. I have been reading ever since. My son Hayden turns 6 months this Friday and I love reading your monthly Harper updates to see what is in store for Hayden in the next month. Thanks for writing and for being a light for Jesus. You have inspired me! Wow, she has changed so much. I just had a baby 6 weeks ago and can't imagine how different he'll be in 6 months! wow, i can't believe it's been 7 months since i was pointed to your blog and started following your journey. i have no idea where 2009 went, that's for sure. enjoy your little girl. she just gets cuter and cuter! Don't you think she's starting to look SO much like her Daddy?! Time IS flying by too quickly! And JM moves up Sunday School next week and I'm not ready for that! 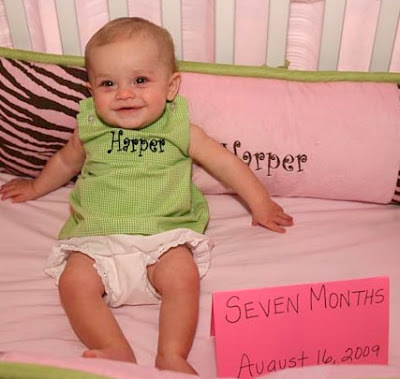 Happy 7 Momths, Harper! What a big girl you are now? You are just as cute as ever. Maybe you could come give Evie some lessons on sleeping at night. Wow! She is adorable and I love her unusual name. Hang on for the ride-it'll go by fast. I love your outfit, cutie pie Harper! It sounds like you are doing so good! I can't believe you are 7 months! Time is passing way too fast! I have never commented on your blog but I read it everyday. I love reading about your adventures with your beautiful daughter. Thanks for sharing. I have a picture of my kids, with this quote along side it. 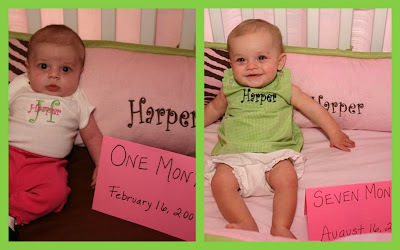 Harper was precious at one month, but she is sooooo pretty at 7 months. What a cutie pie! Yea Harper! Happy 7 Months! Does she have a "taggy"? It's a little piece of soft cloth that has ribbon sewn around the edges like tags. The kids at work (I am a preschool teacher) love them! If she is into tags, it would be great for her!!! Harper is so blessed to have a mommy and daddy that love Jesus and want to make sure she knows Him too! Y'all sure make cute babies :0) How could you not smile looking at that precious face??? I loved reading this post! Did you know that the Kelly who commented first on this post is my sister?? :) She's expecting a miracle baby due at the end of December...we're SO excited!! Anyway, I can totally relate to the whole "tags" love. Ridley could play with tags or anything "hanging" for the longest time! He wakes up just jabbering away. I'm amazed at how much I can love this little person more and more every day. I think it's a little tiny peek at how much God loves us. Have you heard of Taggies blankets? They are for babies who love tags! Maybe Harper would enjoy it?! Happy 7 Month Birthday Harper! I love that you write these for your adorable daughter. It will be so sweet for her to read them when she is older.